I’m back! 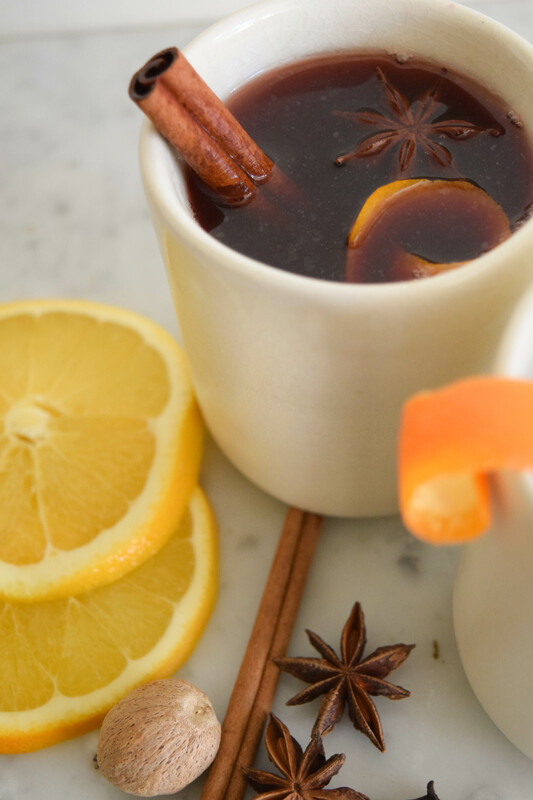 After battling a pesky cold for the past week, I am finally well enough to put together a new recipe for you guys – and enjoying a cup of this delicious mulled wine is certainly helping me feel better, too. Ever since our neighbors put up their outdoor Christmas lights about two weeks ago, I have noticed holiday feelings creeping in. I can’t believe that the year is almost over and time just seems to fly by at the moment, but I am definitely reaching the right mindset for Christmas cookies, candied nuts, holiday feasts, and mulled wine. Having been born and raised in Germany, Christmas markets have always been an essential part of the holidays for me. Almost every little town in Germany has their own market and most of them are open from November 23rd until December 23rd. They are packed with small market stalls offering gifts and kitschy knick-knacks, from impressive traditional wooden Christmas decorations to knitted hats, scarfs, and other crafts, and, of course, all kinds of food. But my favorite part has always been to meet up with friends and enjoy a hot mug of mulled red wine. There is something romantic about standing in the cold, all bundled up with hats, scarfs, and gloves, clutching your mug in both hands to warm your fingers, and blowing on the wine so you don’t burn your tongue; all while chatting and laughing with people you care about. To me, there is no better way to get into the holiday spirit. While I won’t be able to visit a real German Christmas market this year, nothing can keep me from enjoying my mulled wine. 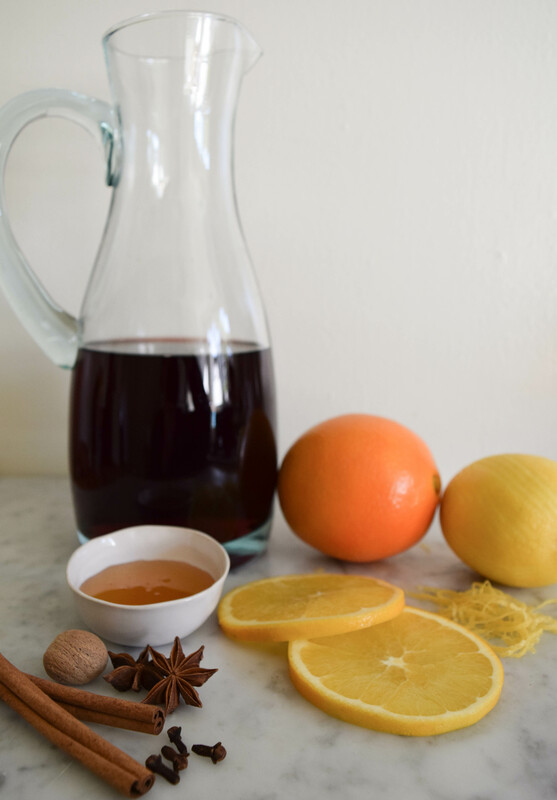 You may have seen bottled mulled wine or little packets with mulling spices at a supermarket, but it’s really worth it to make it at home. Not only is it super quick and easy, but it’s also much cheaper and you can adjust the recipe to suit your taste. The bottled stuff can be sickeningly sweet, but when you make your own, you can avoid all that unnecessary processed sugar. 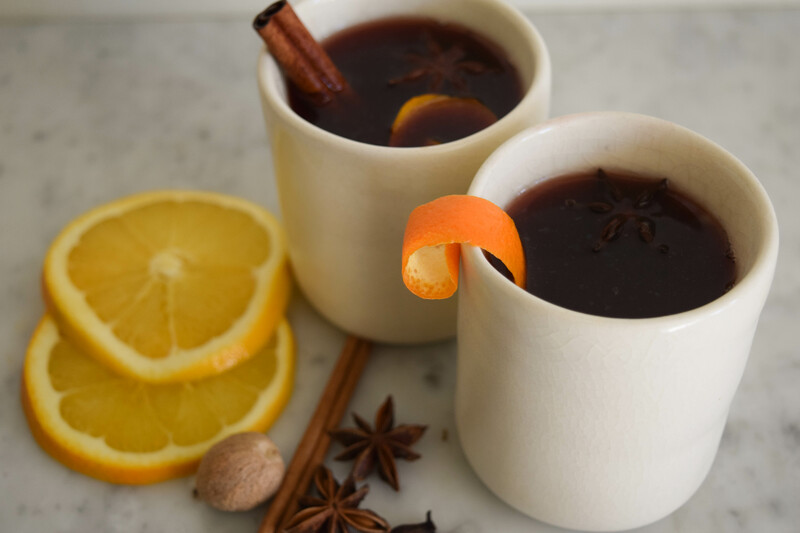 There are a million different versions of mulled wine out there, and I strongly encourage you to experiment and come up with your own mix, but the recipe below is a great starting point. There is simply nothing better to warm you up and lift your spirits on a cold winter night. You can use any type of red wine, but it’s not worth it to spend a lottle of money on a fancy bottle. I recommend using a dry or semidry red, because most of the flavors in the wine will be more concentrated after mulling, and using honey or sugar to sweeten the wine will give you greater control over the final flavor. Use organic oranges and lemons only and wash them thoroughly to avoid adding nasty chemicals to the wine. Be careful not to heat the wine to a rolling boil. After all, you don’t want all that lovely alcohol to evaporate before you get a chance to drink it. If you plan on letting the wine steep for a longer period of time, taste it occassionally and remove the spices once you are happy with the flavor to keep it from becoming too intense. I’d also recommend putting a lid on it so you don’t end up with a thickened red wine syrup at the end of the night. 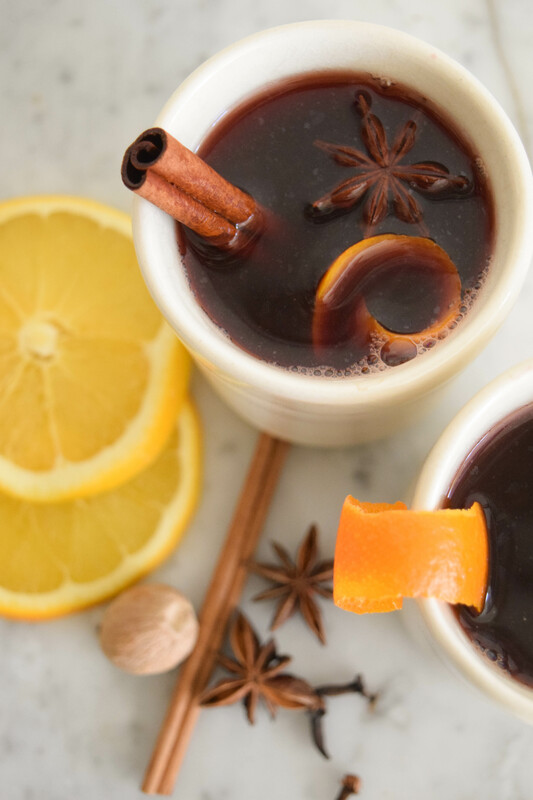 Mulled wine is great for entertaining, simply make a larger batch and let it steep on very low heat (or in an electric slow cooker). And if you are looking for an original, inexpensive present, why not give a bottle of red along with a small cotton bag filled with mulling spices and your very own recipe? Juice one of the oranges and cut the other one into thin slices (save some orange peel from the juiced orange as garnish). Combine wine and orange juice in a medium-sized saucepan. Add cinnamon sticks, anise pods, cloves, nutmeg, lemon zest, and orange slices. Heat until the mixture begins to steam, stirring occassionally. Let steep for at least 10 minutes. Add honey and stir until completely dissolved. Strain or serve with floating spices or citrus peels as garnish. © Anne Moser and 'a bag of flour', 2015.